The Atlanta Silverbacks announced today that they have released David Vaudreuil from his duties as Head Coach of the men’s professional team. Vaudreuil was in his second coaching position since retiring as a player, having previously coached the Jersey Shore Boca PDL side to a 4-8 mark in 2003. ATLANTA, GA — The Atlanta Silverbacks announced today that they have released David Vaudreuil from his duties as Head Coach of the men’s professional team. 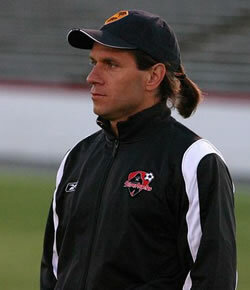 During David Vaudreuil’s 39 games in charge of the Atlanta Silverbacks he guided the team to a record of 17 wins, 6 draws and 16 losses. He was 14-11-3 in his first season last year and was currently 3-5-3 in the USL First Division this season. Vaudreuil was in his second coaching position since retiring as a player, having previously coached the provisional PDL side Jersey Shore Boca to a 4-8 mark. The former MLS player won two MLS Cup championships and one US Open Cup championship as a member of DC United. No replacement or interim coach has been named.